Plain Strap Visors are a type of crownless hat that is made up of a brim and a strap that encircles the head. With the Plain Strap Back Visors, you can keep out the sun out of your eyes while keeping a timeless look on your headwear. When faced with a scorching hot summer day, the last thing someone wants to do is leave their face unprotected. With Visors, this is no longer an issue because their design allows for faces to be safely kept underneath a long, curved bill, shading them from the harsh sunlight. The simplicity of having a singular, plain color, gives way for many different combinations of outfits when paired with other clothing. The Visor features a Strap in the back in order to make adjusting the size a quick and hassle-free process. The Visor can be worn by people of any size, gender, or age due to its simple, yet elegant design. It is also growing in popularity in the fashion world because of its sleek and clean look. The plain color makes it a great addition to any wardrobe and makes it easy to be worn even when the sun is not shining. Plain Visors are attractive as they look sleek and polished. If you are looking for Classic Visors, you can opt for the Plain Strap Back Visor Caps. They are made from different materials like cotton and mesh thus providing you with a lot of comfort. For that classic look, you can opt for the Cotton Convertible Patterned Strap Visor that is very practical as you can wear the visor on both sides. You can wear this visor when engaging in any sports and hobbies. It also comes with a sweatband that catches your sweat so that it keeps your face clean and mess-free. If it is fashion-forward visor you are looking for, why not try the visor with Faux Hair String Visor? It is perfect for cold and windy days as it does not only protect your face against the sun but also provides warmth on your head. 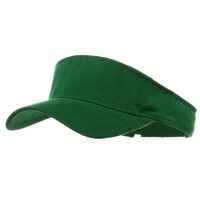 The thing is that there are many styles and designs of plain strap back visors that you can choose from. So whether you are looking for a common cotton visor or Custom Visors , we got you covered. So be sure to browse through our site to find the right style to complement your fashion style.